If you’ve ever wanted to be Superman—soaring above our globe, diving deep in the ocean, or launching into outer space—Google Earth 5 can grant your wish. In exchange, you’ll have to put up with a few bugs, an inelegant interface, and a controversial update system. Still, the delight of a superhero’s-eye view of Earth is almost too much fun to pass up. Google Earth applies satellite imagery and topographical data to a 3-D globe. In some major cities, you’ll even see fully textured 3-D buildings and landmarks. You can enhance these maps with a smorgasbord of relevant data, including photographs, Wikipedia entries, and YouTube videos. (Google Earth downloads data on the fly, so the graphics occasionally stuttered as I traveled the globe, even on a speedy aluminum MacBook.) Learning the program’s basics is easy, but for anything more complex, you’ll need to brave Google’s sprawling online user guide. Bored with Earth? Google Sky offers a map of the heavens packed with Hubble Space Telescope imagery, and Google Mars lets you explore the Red Planet. The latter feature is particularly fun; you can follow the paths of the Spirit and Opportunity rovers, or converse with a Martian chatbot near the famous “Face on Mars.” All these features are available in Google Earth’s free regular version. For $400, you can upgrade to Google Earth Pro, which I didn’t review. According to Google’s Web site, the Pro version includes faster performance, the ability to make movies of your virtual travels, support for GIS (geographical information system) and GPS data, and higher-resolution image printing, among other features. Historical imagery lets you slide back and forth on a timeline of available aerial and satellite photography. Older images can be impressive, but for now, they’re often scarce. I rarely found photos more than a decade old, and many of those were understandably less detailed than the latest images. Tours let you share journeys with other Google Earth users, either by automatically following a predetermined route, or recording what you see as you zip around in real time. You can add audio, text, and images to explain different landmarks. Tours worked fine for me, except for audio. Google Earth consistently cut off the first few seconds of sound after I hit the record button; according to Google, the program needs a few seconds to load audio drivers before it can actually begin capturing sound. Google Earth 5 is a lot of fun, and the price—free—is definitely right. But it’s often so eager to be useful that it can be unusable. With so many data layers, it’s hard to decide where to begin. You can switch individual layers on and off, but it’s sometimes hard to tell from layer names alone whether they will be useful or interesting. 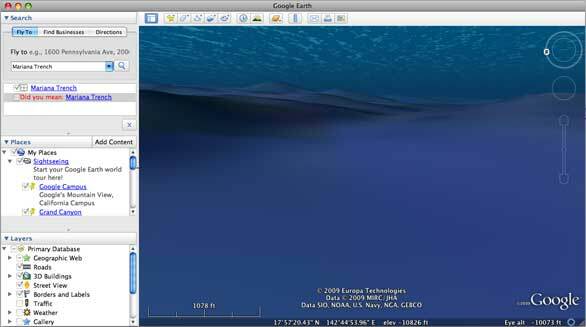 Limited topographical data makes Google Earth’s underwater views—like this, supposedly the Mariana Trench—less than impressive. The interface felt cramped on a 13-inch laptop screen, squeezing Fly To, Places, and Layers panes into a sidebar to the left of the main window. It took a lot of scrolling to see each pane’s entire contents; expanding one pane only made the others smaller. The program also has a surprising number of bugs. Descriptions in the Places window sometimes illegibly displayed text atop other text. When I created a new placemark, Google Earth wouldn’t save location names more than one word long unless I also added a description. Google says it’s aware of both issues and working on fixes, though programmers couldn’t consistently replicate the latter problem. In addition, when I attempted to share a placemark with other users, I was taken to a bare-bones Web page saying that feature had been temporarily disabled. According to Google, it’s upgrading the Web site tied to this feature and will restore service soon. Privacy buffs may also object to Google’s Update Engine, which installs with Google Earth and can’t be deactivated or removed on its own. The Mac version checks for updates once every day, rather than when Google Earth is opened. It also invisibly activates every two hours to see if a day has passed since its last check, whether Google Earth is running or not. Google Earth lets you know about the updater before you install, but if you’re not wild about an invisible program under your computer’s hood talking to Google every day, you might prefer some way to turn it off. Google says it’s heard users’ concerns about the updater, and it’s working on a better solution. Historical imagery lets you travel back in time to see some areas as they appeared years or decades past. 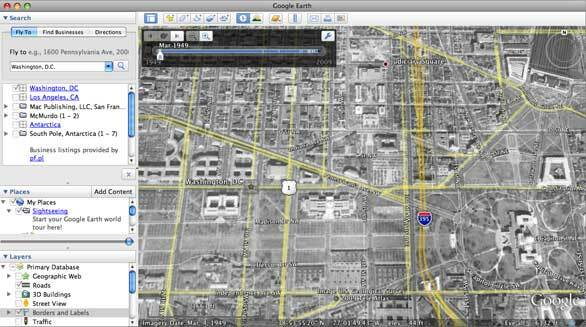 Google Earth 5 offers a wealth of educational information in a fun package. Its nonexistent price also makes its minor inconveniences far more forgivable. If you don’t object to the updater, it’s well worth a download.